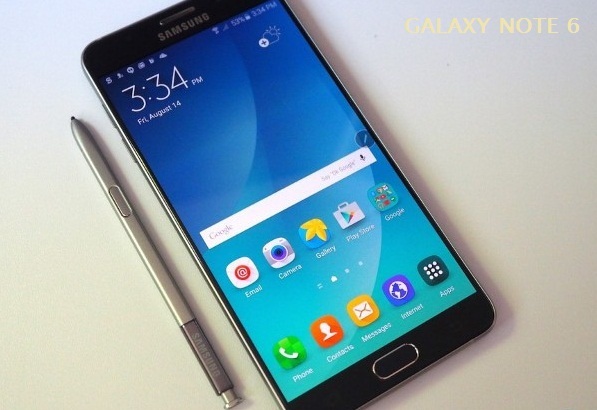 A Korean publication, The Bell, reportedly claimed that the Samsung Galaxy Note 6 might be unveiled in July 2016. Surprisingly, the smartphone might be introduced with the all new Android N. If this should be true then that means Google must officially launch and release the Android N OS with a new Nexus device before or in July 2016, leading to further speculations that Google will release a stable version of Android N before July. In addition to that, a reliable Chinese source, Weibo, which is known for its pretty accurate leaks in the past just came up with a new update concerning the next Galaxy Note. Apparently the Galaxy Note 6 will feature a stunning 5.8″ Slim RGB AMOLED display with 1440 x 2560 resolution. Allegedly, this display will be packed with 1024 pressure points. The ‘RGB’ might be pointing towards a new technology developed by Samsung for Note 6’s AMOLED display. 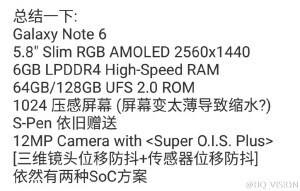 Further analyzing the specs sheet leaked by Weibo we find that the new Note 6 will feature 6GB RAM and 64GB/128GB internal storage. Although this sounds like an exaggerated anticipation, this should be kept in mind that last year Samsung successfully released S6 with 3GB RAM and Note 5 with 4GB RAM. Apart from that, Samsung itself researched, developed and will manufacture the 6GB RAM itself, being the first company ever to start mass production of 12GB LPDDR4 RAM chips with the help of a 20nm process technology. Samsung itself mentioned in their press release that this breakthrough will allow them to manufacture smartphones with an amazing 6GB RAM, so this shouldn’t come as a surprise if the next Note comes with the whooping 6GB RAM. On the camera and processor side, the Note 6 is expected to have many similarities with the Galaxy S7 and S7 edge. Just like S7 and S7 edge, Note 6 might be equipped with a 12MP camera packed with OIS Plus system plus it might feature two SoC solutions, most likely Snapdragon and Exynos. Needless to say, the Note 6 will come with an S Pen and the S Pen might be the one rumoured sometimes ago during the Galaxy Note 5 pre-release, which can be used as a stand to hold the Smartphone in an upright position. For now, these are the rumours and updates we have on the Galaxy Note 6. Stay tuned to this Blog by subscribing to our FREE email updates for you to get our upcoming posts directly into your mailbox. Cheers!